Indiscriminate disposal of spent engine oil is a global concern because of the numerous health risks to animals and humans following exposure. Indigenous fungi were isolated from soil samples polluted with spent engine oil (SEO) at Mgbuka-Nkpor, Nigeria. They were identified based on their cultural and microscopic characteristics and confirmed using their 18Sr RNA gene sequence. A phylogenetic tree of the isolates was constructed using the neighbour joining method. Heavy metal analysis of spent and new engine oil was conducted using Varian AA240 Atomic Absorption Spectrophotometer. The effect of varying concentrations of heavy metals on SEO degradation by the isolates at different pH levels was also determined. Two fungi isolates were obtained from this study. They were identified and confirmed as Candida tropicalis and Aspergillus clavatus. The concentration of the heavy metals (zinc, lead, cadmium and copper) was significantly higher (P < 0.05) in spent engine oil when compared to the new engine oil. 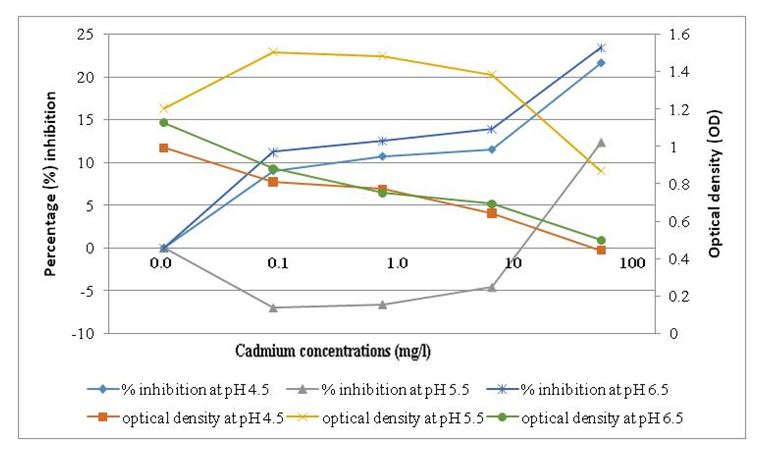 There was negative inhibition (stimulation) in the media containing both the single and mixed culture of the isolates, in the presence of cadmium at pH 5.5. Moreover, highest stimulation (20%) in SEO degradation was recorded in the presence of 10 mg/l copper at pH 5.5, in the media containing A. clavatus. These results showed that the pure and mixed culture of the isolates (C. tropicalis and A. clavatus) have promising potential for effective bioremediation of spent engine oil polluted soil co-contaminated with cadmium and copper at pH 5.5.